Come to the launch of a ground-breaking new project: Anyone’s Child Mexico a participatory online i-documentary – families living on the frontline of Mexico’s drug war tell their unheard, real-life stories in their own words. The project is a collaboration between families who’ve lost their children to Mexico’s bloody drug war, creative technologists, the University of Bristol (UK) and civil society organisations. It will bring attention to the families’ plight and encourage the government to end the drug war and to legally regulate the drug market. Join us to explore this major new online documentary. 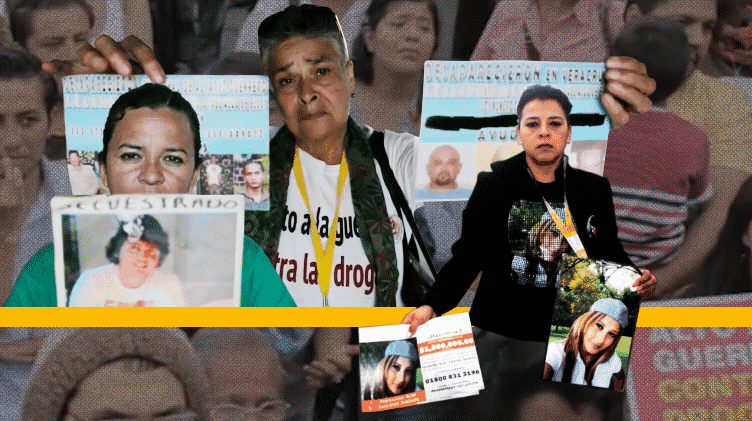 Use our phone line to record your testimony and discover why families are now uniting internationally to call for legal regulation of the drug trade. Where: Latin American Conference on Drug Policy (Confedrogas), Sheraton María Isabel, Mexico City, Paseo de la Reforma N°325, México, DF. 06500. Find us in the red telephone box at the Harm Reduction Fair. What: Explore our new online living documentary and add your testimony to our phone line to put pressure on policy makers to end the drug war. “These stories demonstrate that there is no ‘war on drugs’. It’s ordinary people whose lives are being destroyed by our global drug war. The voices of the impacted families have spoken and our politicians must listen. Please watch our idoc and leave your testimony. This project has been funded by Bristol University’s Brigstow Institute as part of a new collaboration looking at using technology for social change. Connecting a phone line in Mexico with an online interactive documentary we will gather testimony from ordinary families in Mexico. They will demonstrate to the Mexican government that a drug policy enforced by police and soldiers will only lead to more degradation and death. And that legal regulation would all but end it.